John Francis Kelly (born May 11, 1950) is a retired United States Marine Corps General. He was the 28th White House Chief of Staff from July 31, 2017 to January 2, 2019. 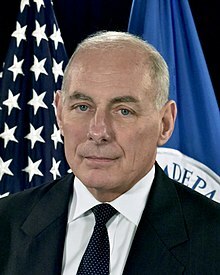 Kelly was the 5th and current United States Secretary of Homeland Security serving from January through July 2017. He is the former Commander of United States Southern Command (USSOUTHCOM). Kelly last served as the commanding general of the Multi-National Force—West in Iraq from February 2008 to February 2009, and as the commander of Marine Forces Reserve and Marine Forces North in October 2009. Kelly was born on May 11, 1950 in Boston, Massachusetts, into an Irish Catholic family. He served for one year as a United States Merchant Marine. Kelly initially enlisted in the U.S. Marine Corps in 1970, and was discharged from active duty as a sergeant in 1972. Kelly received a Master of Science degree in National Security Studies from the Georgetown School of Foreign Service in 1984. He also studied at the University of Massachusetts, Boston. On December 7, 2016, it was reported that then-President-elect Donald Trump nominated Kelly to be the fifth United States Secretary of Homeland Security. On January 20, 2017, Kelly was confirmed as Secretary of Homeland Security by the United States Senate with a vote of 88-11. On that evening he was sworn in by Vice-President Pence. On July 28 2017, he was appointed to replace Reince Priebus as White House Chief of Staff. Early into his tenure, media outlets such as The New York Times, The Washington Post and FiveThirtyEight speculated that Kelly would bring moderation and discipline to the White House. In August 2017, early into Kelly's tenure, the Washington Post wrote that Kelly had "left no discernible imprint on the White House's philosophy" and that it was unclear if he would bring calm and rigor to the White House. On December 8, 2018, Trump announced that Kelly would be leaving the position by the end of the year. He left the office on January 2, 2019. Kelly is married to Karen Hernest. They have three children. In 2010, Kelly’s 29-year-old son, First Lieutenant Robert Kelly, was killed in action when he stepped on a landmine while leading a platoon of Marines on a patrol in Sangin, Afghanistan. Robert Kelly's death made John Kelly the highest-ranking military officer to lose a son or daughter in Iraq or Afghanistan. ↑ Peterson-Withorn, Chase (December 22, 2016). "Here's What Each Member Of Trump's $4.5 Billion Cabinet Is Worth". Forbes. ↑ 2.0 2.1 Baker, Peter; Haberman, Maggie. "Reince Priebus Pushed Out After Rocky Tenure as Trump Chief of Staff" (HTML). New York Times. ↑ "Nominations before the Senate Armed Services Committee, Second Session, 112th Congress" (PDF). Government Printing Office. Retrieved December 13, 2016. ↑ Keenan, Sergeant Eric (January 14, 2016). "Gen. John F. Kelly reflects on 45 years of service". Defense Media Activity. U.S. Marine Corps. Retrieved December 13, 2016. ↑ "Donald Trump picks Gen. John Kelly for Department of Homeland Security secretary". CBS News. 7 December 2016. Retrieved 7 December 2016. ↑ "Senate vote on John F. Kelly nomination". Senate official website. January 20, 2017. Retrieved January 22, 2017. ↑ Jr., Perry Bacon (2018-02-20). "How The Media Bungled The John Kelly Story". FiveThirtyEight. Retrieved 2018-02-20. ↑ Nixon, Ron; Shear, Michael D. (2017-07-28). "John Kelly, New Chief of Staff, Is Seen as Beacon of Discipline". The New York Times. ISSN 0362-4331. Retrieved 2018-02-20. ↑ Jaffe, Greg; deGrandpre, Andrew (2017-07-28). "In John Kelly, Trump gets a plain-spoken disciplinarian as his chief of staff". Washington Post. ISSN 0190-8286. Retrieved 2018-02-20. ↑ Costa, Robert; Rucker, Philip (August 9, 2017). "Even in North Korea crisis, retired general John Kelly is an apolitical force in a White House divided by ideology". Washington Post. ISSN 0190-8286. Archived from the original on October 26, 2017. Retrieved October 26, 2017. ↑ Prokop, Andrew (8 December 2018). "John Kelly is out as White House chief of staff, Trump announces". Vox. ↑ Landler, Mark; Habberman, Maggie (December 7, 2016). "Donald Trump Picks John Kelly, Retired General, to Lead Homeland Security". New York Times. Retrieved January 4, 2017. "Multi-National Force–West website". Retrieved November 27, 2008. Noel, Kristen (October 12, 2008). "U.S. Presence Still Needed for Stability in Anbar Province, General Says". News Articles. Armed Forces Press Service, U.S. Department of Defense. Retrieved November 27, 2008.